Corals growing in high-latitude reefs in Western Australia can regulate their internal chemistry to promote growth under cooler temperatures, according to new research at the ARC Centre of Excellence for Coral Reef Studies at The University of Western Australia. The study, published today in Proceedings of the Royal Society B, suggests that ocean warming may not necessarily promote faster rates of calcification in reefs where temperatures are currently cooler (lower than 18C). Lead author Claire Ross said the study was carried out over two years in Western Australia's Bremer Bay, 515km south-east of Perth in the Great Southern region. Bremer Bay is a renowned diving, snorkelling and tourism hot spot due to its stunning crystal clear waters, white sand and high marine biodiversity. "For two years we used cutting-edge geochemical techniques to link the internal chemistry of the coral with how fast the corals were growing in a high-latitude reef," Ms Ross said. "These high-latitude reefs (above 28 degrees north and below 28 degrees south) have lower light and temperatures compared to the tropics and essentially provide natural laboratories for investigating the limits for coral growth." Ms Ross said the researchers expected the corals to grow slower during winter because the water was colder and light levels lower but they were surprised to find the opposite pattern. "We were able to link the remarkable capacity for temperate corals to maintain high growth during winter to the regulation of their internal chemistry," she said. "We also found that there was more food in the water for corals during winter compared to summer, indicating that (in addition to internal chemical regulation) corals may feed more to sustain growth." Coral reefs are one of world's most valuable natural resources, providing a habitat for many ocean species, shoreline protection from waves and storms, as well as being economically important for tourism and fisheries. However, studies have shown that the important process by which corals build their skeletons is under threat due to CO2-driven climate change. The effects of climate change on coral reefs are likely to vary geographically, but relatively little is known about the growth rates of reefs outside of the tropics. "Our study is unique because it is among the first to fully decipher the corals' internal chemistry," Ms Ross said. 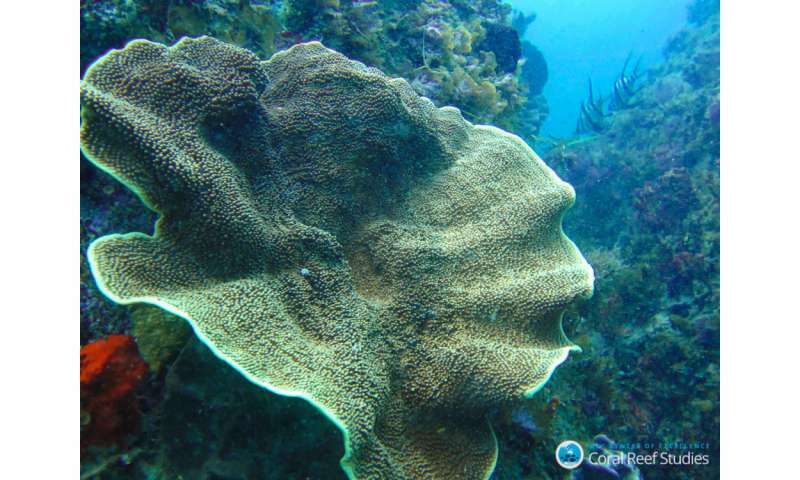 "The findings of this study help better understand and predict the future of high-latitude coral reefs under CO2-driven climate change."